Keep Santa Cruz weird, right? Santa Cruz is a funky and cool place where you'll never have the same experience twice. Whether you're on the pier visiting the sea lions (recommended! ), on the boardwalk riding rides or shopping downtown, there is always something different and new going on. With Santa Cruz's eccentric atmosphere, it has great vegan friendly spots. The vegan food in Santa Cruz is top notch and it ranges from total vegan junk food to about as healthy as you can get when eating out. Pick your poison. Or two. Cafe Gratitude is a great place to go if you want to eat out without having that I-went-out-to-eat-and-I-ate-horrible-food feeling. The food is really fresh and you feel great after eating it. Located in downtown Santa Cruz, the space is bright and airy so it's a pleasant location to sit and enjoy a meal before walking down the the beach. We always start out with I am grounded, which is roasted potatoes with chipotle cheese topping. These are amazing. Warm and satisfying, these are great so share because the portion is pretty big. Two people will definitely clear the plate. My favorite entree at Cafe Gratitude, is I am transformed. These tacos are so fresh and yummy every time I order them. They never disappoint. From the picture shown, you may think that they filled most of the plate with plan salad instead on tacos, but let me tell you something. The salad they serve with the tacos is amazing as well. It doesn't look super impressive but it has tons of flavor and goes great with the rest of the dish. If you are even a mild taco fan, I would high recommend I am transformed. Last time we enjoyed Cafe Gratitude, we strayed from our favorite on the menu (see above) to try the special they had that day. Unfortunately, I can't remember what the special was called (Sorry!) but it was a really good veggie burger. Again, the salad that they serve with almost all the dishes is amazing. Once you've tried Cafe Gratitude, you be back to try all the of amazing dishes in their menu. Note: Cafe Gratitude serves honey. So, if your a non honey eating vegan like myself make sure you ask if anything your ordering contains honey. Also check out their locations in Berkeley, Los Angles, and San Diego. Saturn Cafe is a cool funky place that is always fun to go. There is character covering every inch of the restaurant, which makes you feel cooler just by being there. The vegetarian restaurant is not only done in a space theme but there are pop culture references all over the walls and tables. It's a really hip place. Last time we were there we tried the brunch. As I have mentioned before, I am a huge pancake fan so it was no surprise that I went for the banana pancakes. They were oh so good and the syrup and walnuts made them out of this world. My husband had the vegan spuds. This dish has everything you could want for breakfast all mixed together and topped with vegan cheese and sour cream. Yum. I have to admit that I ate probably half of his food and I definitely will be ordering this on my own next time we're there for bunch and I'm feeling something savory. So there you have it. Great sweet and savory options for brunch at Saturn Cafe. Which ever mood your in, you won't be disappointed with your choice. Seasoned organic tofu and home fries scrambled together with sautéed mushrooms, onions and bell peppers. Topped with melted vegan cheese and vegan sour cream. Woodstock's Pizza in Santa Cruz is a regular pizza place with one hell of a vegan pizza. I tried this place on a recommendation from a friend and I am hooked! The pizza we order is the Grateful Veg with Daiya cheese. It has a thick crust, tons of sauce and a mountain of veggies. That's my kind of pizza! Now every time we stop in Santa Cruz I suddenly have a craving for pizza. Thanks, Woodstock's! Mutari is a delightful little chocolate house that serves chocolate bars and a variety of chocolate drinks. 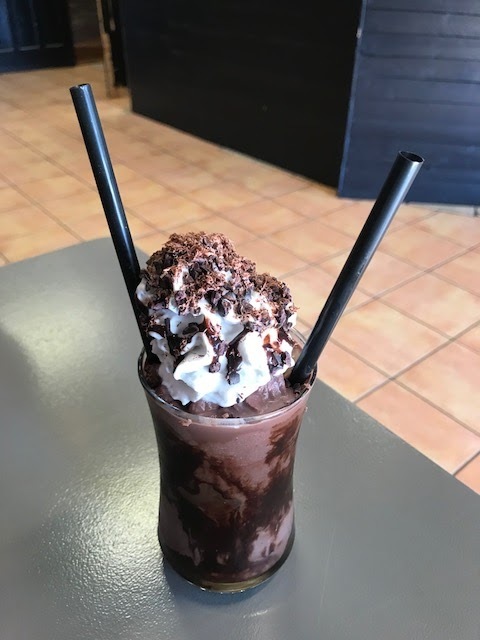 Nothing is better on a hot California day than a vegan frozen hot chocolate with their own vegan whipped cream. This was so tasty and a great size for sharing with someone special. This is a great place to stop and relax while in enjoying their unique vegan chocolate drinks. Buttercup Cakes is a bakery and cafe on the main drag of downtown Santa Cruz. They offer a few vegan cupcake options in mini and regular sizes everyday. The day I stopped in I tried the Chocolate Caramel with chocolate cake and brown sugar frosting, drizzled with vegan caramel sauce and ganache. It was pretty good and a great option if you are in Santa Cruz and are looking for a quick and tasty sweet snack. I'm looking forward to trying out their other vegan flavors! What are your favorite vegan spots in Santa Cruz? We have the exact same taste at Café Gratitude - I always get I am transformed. I love the potatoes too. And their desserts are awesome. As for Saturn, I like getting the shakes & fries =) So good. Have you guys tried other places there? Engfers has vegan woodfired pizza - it's amazeballs. Oh and there's Dharma's. That place is pretty good too! The shakes at Saturn are insane. I try to only have them once in awhile but they are so hard to resist! I haven't heard of either of those places. Thanks for the tip! If we eat at them I'll be sure to add them to the post. Thanks!